For the past decade, we have been using an Accelerated Math computerized program as a supplement to regular classroom instruction. In order to build a solid math foundation, every child must learn every concept without fail and we do not believe that can be accomplished by only using classroom instruction. Accelerated Math helps accomplish that goal by introducing one concept at a time and requiring the student to master it before going on to the next concept. Accelerated Math allows students the time needed when they struggle and keeps them from wasting their time reviewing already learned concepts. As students work their way through Accelerated Math worksheets, they mark their answers on a computerized card and get their results back immediately. In the upper grades, math groups are used during classroom instruction to aide comprehension. Groups allow students to mentor each other and there are as many as five math groups meeting in a single classroom. Because students can work at their own pace and often that pace is quite quick, we have an excellent record of our students beginning Geometry as Freshmen which allows college math classes to be taken their senior year. Children love competitions and we try to use it as a teaching tool as often as possible. We sponsor a Math Festival for our students grades five through eight. 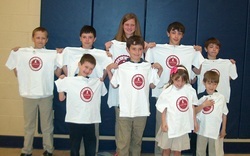 Students in all eight grades participate in a Math-A-Thon which benefits St. Jude's Hospital. At our Math Festival, teachers endeavor to create evenly-matched teams. There are both team and individual winners and at the end of the day, all of the students know a little more about math. "I appreciate the school participating in the math-a-thon. It gave a lot of kids a chance to shine in an academic setting and when I read the school newsletter, it was really fun to read the FOURTEEN different children named. My child got a bookmark for a prize that wasn't listed in the newsletter so even more than those fourteen were honored." Instructional gaming is one of the most motivational tools in the good teacher's repertoire. Chess motivates students to become willing problem solvers and spend hours quietly immersed in logical thinking. In study after study, it has been shown that the chess-playing students show a significant advancement in spatial, numerical and administrative-directional abilities, along with verbal aptitudes, compared to control groups. The improvements held true regardless of the final chess skill level attained. Each year, Sts. Peter & Paul 5th, 6th, 7th & 8th graders practice and then compete in a classroom chess tournament. In the Fall of 2017, we invited a chess teacher to help the students with their strategy and the pictured students are practicing. The spring chess competitions are fierce and because all children academically benefit from chess, everyone wins!